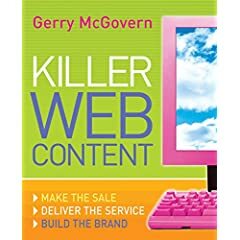 Gerry McGovern was on top form last night at the launch of his new book, "Killer Web Content". If you have ever seen him speak, you will know why he is consistently listed as one of the web's most influential of commentators. Not only are his ideas simple and compelling, his delivery is incredibly entertaining! Take his example of a well known electrical manufacturer. Gerry convinced them of the misunderstandings that could arise from the homepage slogan 'Find a dealer'—could we buy a TV and LSD from these guys?! The key advice I got from the session last night was to bring website customers as close as possible to the content creation process. Indeed, it occured to me afterwards that perhaps readers should be asked to write the website text themselves. For example, would it make sense to invite random (or regular) visitors to a site to suggest better homepage text via some type of online survey? I wonder if anyone has tried it before? Although a lot of trash might be received, some real gems could also emerge. These are likely to be much better than anything marketing can come up with. For one, such users would be entirely unconcerned with 'brand integrity' which—as Gerry described—can be massively obstructive to good content.